How do I recharge with a T-handle– or Gauge-handle–style recharge hose? Follow these steps to recharge your car. Remember to always wear safety glasses and gloves when recharging your vehicle’s A/C. 1. Determine the ambient (outside) temperature before starting to charge your car. If the ambient temperature is 55°F or below, do not charge the car. To determine the proper pressure of your car’s A/C, set the bezel on the pressure gauge to the outside temperature. If your gauge does not have a bezel dial with the corresponding temperature and pressure, consult a pressure temperature chart. After determining the proper pressure for your A/C system, charge to that pressure. 2. Locate the low-pressure service port. Important note: Never use the high-side port to add refrigerant. Doing so is dangerous and could cause you harm. If you are having trouble locating your low-side port, try using our low-side port locator. If you still cannot find your low-side port, locate the large-diameter aluminum line coming from the back of your car’s compressor. The low-side port will be located somewhere along that line. Still can’t find the low-side port? Give our customer support line a call at 1-888-318-5454. 3. Remove the service cap from the low-side port and wipe any dust from the port with a clean rag. Attach the charging hose to the low-side port. Tug gently on the hose to insure a snug connection. Note: The hose will only connect to the low-side port fitting. If the hose does not easily attach, you are trying to attach it to the wrong port. 4. Turn the handle clockwise until it will not turn anymore. This extends the piercing needle into the top of the can. 6. Keep the can in the upright position when dispensing product. Rotate the can between the 12 o’clock and 2 o’clock positions when charging. It is important to stop every 30–45 seconds to take a pressure reading on the system to prevent overcharging the system. 7. When the A/C is charged to the proper pressure, close the valve on the top of the can and remove the charging hose from the low-side port. Replace the sealing cap on the low-side port. Store any remaining refrigerant in a cool dry spot in your garage. How do I recharge with a trigger-style recharge hose? Follow these steps to recharge your car. Remember to always wear safety glasses and gloves when recharging your A/C. 2. Locate the low-pressure service port. Important note: Never use the high side port to add refrigerant. Doing so is dangerous and could cause you harm. If you are having trouble locating your low-side port, try using our low-side port locator. If you still cannot find your low-side port, locate the large-diameter aluminum line coming from the back of your car’s compressor. The low-side port will be located somewhere along that line. Still can’t find the low side port? Give our customer support line a call at 1-888-318-5454. 3. Remove the service cap from the low-side port and wipe any dust from the port with a clean rag. Attach the charging hose to the low-side port. Tug gently on the hose to ensure a snug connection. Note: The hose will only connect to the low-side port fitting. If the hose does not easily attach, you are trying to attach it to the wrong port. 4. Squeeze the handle to start the product flowing. 5. Keep the can in the upright position when dispensing product. Rotate the can between the 12 o’clock and 2 o’clock positions while you are charging. It is important to stop every 30–45 seconds to take a pressure reading on the system to prevent overcharging it. 6. 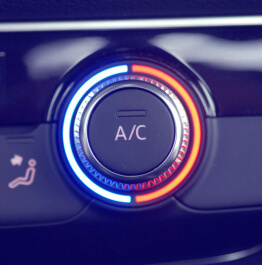 When the A/C is charged to the proper pressure, remove the charging hose from the low-side port and leave the trigger mechanism on top of the can. Replace the service cap on the low-side port. Store any remaining refrigerant in a cool, dry spot in your garage. Why does the bezel on some of the gauges turn? The blue bezel turns on the gauge so that you can set the pressure range as it relates to the outside temperature. Here is how it works: Determine the outside temperature around your car. Turn the bezel so that the arrow points to the outside temperature. Notice the “V” shape on the dial. This is the appropriate pressure range based on the ambient (outside) temperature. When reading the pressure, if the arrow is below the range, then charge the car until the needle on the pressure gauge is within the range. If it is above the upper end of the range, your system is overcharged. In this case, you should seek the help of a qualified technician to recover refrigerant from your system to bring the system back into the proper range. Never vent A/C refrigerant into the atmosphere. It is harmful to the environment and illegal to do so.